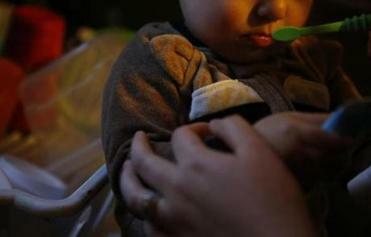 Gayle Suzor took care of a 15 day-old foster child at her home on March 17. PALMER — The disheveled toddler reeked of urine when she arrived on Gayle Suzor’s doorstep in the arms of a state social worker. She had been plucked from a car after her mother, who was high on drugs, was pulled over for driving erratically. Suzor’s was the closest foster home available in the western part of the state. It was 9:30 p.m. The harried social worker and her colleague knew almost nothing about the thin little girl with sad brown eyes, just her name, and that she was a day past her first birthday. Does she have allergies? Suzor asked. The social workers didn’t know. Does she drink from a bottle? They couldn’t say. They handed over the toddler’s musty-smelling diaper bag. Suzor watched the women drive away as she cradled the frightened child. Now what do I do? she thought. Since that night two years ago, Suzor has sheltered more than a dozen children. She’s among a legion of foster parents who toil in obscurity, opening their hearts and homes to some of the state’s most vulnerable kids. “They are just so little, so injured, and you really want to wrap them in your arms and keep them all safe,” Suzor said. Almost every night, social workers, with kids in their back seats, are crisscrossing Mass. or camping out at a 24-hour McDonald’s as they await word of a foster family with space for another child. But instead of doing everything possible to assist foster parents like Suzor, the state has done little to lighten their load, and in many ways has made the work even tougher. Some 2,000 families have stopped accepting foster children in the past five years — almost as many as the total number of foster families currently in the system. 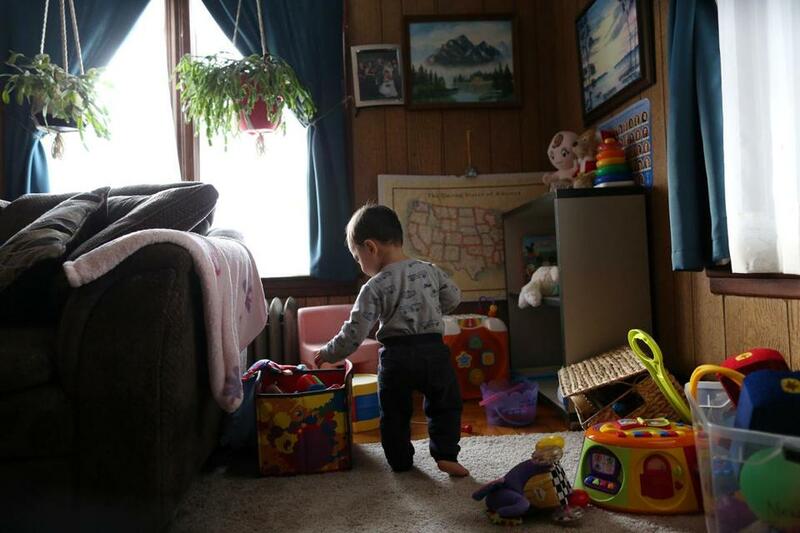 The departures have further strained the longstanding gap between available foster homes and the thousands of abused and neglected kids who need a safe haven. One of Gayle Suzor's foster children at play. The shortage has forced social workers to bounce children from one temporary foster placement to another, compounding their trauma. Why are so many foster parents leaving? The Department of Children and Families can’t really say, as it doesn’t track the departures. A chance to assess how to better serve foster families, slow the exodus, and establish more stability has been squandered. But where the state has little to offer, the families have much to share. Interviews with current and former foster parents offer insights into widespread problems in DCF that make foster parenting even harder than it inherently is. The parents describe a chaotic state system that fails to supply them with vital information and training, or sufficient psychological support for kids who badly need it. Hanna Burnett, another MetroWest mother who stopped fostering last year after four years, said she quit because DCF never shared enough information, even about children who had been in the system for a while. Marylou Sudders, the state’s Health and Human Services secretary, said Massachusetts is striving to reform its foster care system. But that mission has taken a back seat while the agency, in crisis following the deaths of several DCF-monitored children since 2014, has focused on boosting its ranks of social workers in order to monitor children more closely. One of the most frustrating, and seemingly easy to fix problems, foster families say, is communication. The state often fails to relay basic information that is already in a child’s records. Andrea, a foster parent on the North Shore, said she grew anxious when a toddler she was fostering didn’t have a bowel movement in his first three days in her home. When prune juice didn’t work, she decided to bring him to the doctor. Only then did a DCF social worker check the boy’s file and tell Andrea what she found: He had a history of constipation. The state also regularly fails to pass along personal details about children, who are often too young or too troubled to articulate their fears and desires. And as children are hopscotched from one temporary home to another, there is no system in place for one foster family to share basic information with the next. Such details, foster parents say, could go a long way toward easing scary transitions and soothing traumatized youngsters: She’s afraid of the dark, but a night light comforts her. Her brother loves chicken nuggets. “You get nothing. We have so much technology these days, and they are not utilizing any of it,” said Christine, a foster parent in the MetroWest area who asked that her last name not be used to protect her family’s privacy. Christine said a secure, encrypted state computer system would allow families to swap helpful information. It could also allow families to share vital information with local DCF offices, which are so technologically starved there isn’t even a statewide computerized system for tracking which families are accepting children on any given night. “Foster parents should have a profile they can manage themselves stating how many open beds they have, if they are on vacation, and what age and gender of children they will foster,” she said. Christine started fostering after a parent at her children’s preschool spoke of the acute need for others to step forward to help. That was in 2011, and since then she and her husband have sheltered at least 30 youngsters, all while raising their own three children in a spacious Colonial-style home with a generous backyard. They have taken in children born with opiates in their system and nearly inconsolable in withdrawal, a 3-month-old with three fractures in her arm, an infant paralyzed from the waist down. They have toilet trained at least seven youngsters. One was a morbidly obese 4-year-old girl whose diet had consisted of Pop Tarts and Skittles. Christine toilet trained her in a weekend using Skittles as a prize. But Christine has also felt overwhelmed. She struggled especially to help three preschoolers who had become catatonic with severe post-traumatic stress from the abuse they suffered before they were removed from their parents. She has tried to use tips she learned in earlier trauma therapy visits for other foster children, but she’s found each child’s situation is different, and that expert help is often necessary. Yet Christine and other foster parents complain that the state hasn’t done enough to ensure there are counselors and mental health specialists for traumatized children who are cutting themselves, striking out in anger, or withdrawing from normal interactions. Foster children have insurance through MassHealth, the state’s Medicaid system, but the wait for therapy typically takes months, they said. The state’s failure to provide prompt mental health services for low-income children has been a longstanding issue for Massachusetts. A federal judge recently excoriated the state for not providing prompt mental health care for children on Medicaid. 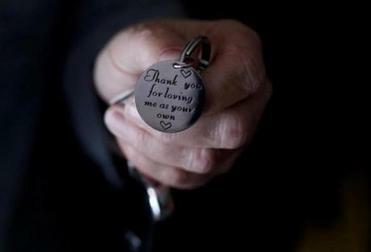 A key chain given to Suzor by a parent who was hoping to adopt one of her foster children. “You have these poor kids, who are damaged, they’re hurt, and you don’t know how to help them,” said Gayle Suzor, the foster parent who lives near Palmer. She remembers the call that finally came for a 5-year-old girl she had been fostering for seven months. The youngster, who often refused to eat and sometimes imitated sexual acts she apparently witnessed in her home, had finally secured an appointment for mental health therapy. But the call came two weeks after the girl had left Suzor’s home to be returned to her father. A 30-hour training course is required to become a foster parent. But foster families say they are still ill-prepared to handle the complexity and severity of health problems they encounter, especially with opioid-exposed infants and children who have discovered their parents overdosed or dead. The Massachusetts Society for the Prevention of Cruelty to Children, a nonprofit with a $1.8 million annual state contract to coach foster parents, is starting Internet sessions to make additional training more widely available. 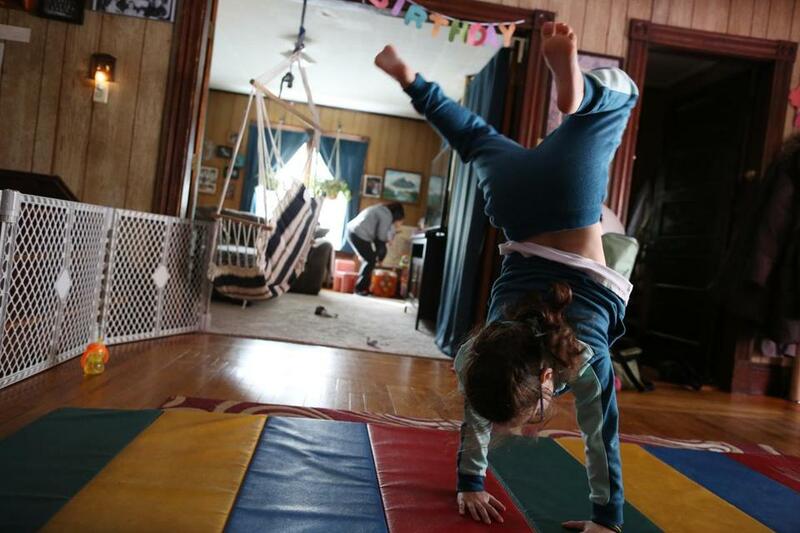 Suzor’s daughter Joley turned cartwheels as Suzor tended to a 16-month-old foster child. UMass Memorial Medical Center is also host to an experimental, grant-funded program that teaches foster families how to cope with children’s emotional distress. One trauma coach, Diane Lanni, is a former foster parent who quit two years ago after nearly a decade, because she said she sorely needed better guidance from DCF. But that program only reaches several dozen families in Central Massachusetts. The hospital is hoping to expand the program later this year, but critics say the state needs to take the lead and reach more families, faster. Without that kind of help, more foster families will quit, said Adam Pertman, president and founder of the National Center on Adoption and Permanency, a research and advocacy nonprofit. “We need to find foster parents, but if we find them and don’t give them the resources they need, we will have a harder time finding them, because word gets around,” he said. Massachusetts foster parents also commiserate about another maddening problem — inconsistent rules across the 29 DCF local offices. Parents often take in children whose cases are assigned to different offices with different requirements, leaving families confused and exasperated. “Each office is an entity unto itself,” said Suzanne Cox, the former foster parent. Some, for instance, allow foster children to attend sleepovers at their friends’ houses, with the understanding that foster parents will use common sense to ensure the situation is safe. Other offices require foster parents to first get a criminal background check for every adult in the friend’s house. Suzor cared for a 15-day-old foster child. “They are just so little, so injured, and you really want to wrap them in your arms and keep them all safe,” she said. The Massachusetts Alliance for Families is seeking to relieve some of these frustrations through legislation, the Foster Parents Bill of Rights, which would grant foster parents more autonomy. It also would require DCF to share more information with foster families, and offer them more training. The legislation is an acknowledgment of the enormous commitment involved with being a foster family, which in addition to the mandated training includes background checks, home inspections, and attending myriad meetings with lawyers, social workers, and doctors’ appointments. Foster parents are typically paid about $25 per child per day. She said the department would streamline inconsistent rules, which she said evolved from “a legitimate fear of bad things that have happened to kids in the department’s care historically,” but were never written down as formal department policy. She also said DCF is trying to improve communication with families. The agency, which has not updated some of its technology for a decade, plans to introduce an intranet system later this year that will allow the state to post notices to foster parents (it will not, however, let families communicate with one another). It’s also considering e-mailing exit surveys to families who quit. The state acknowledges the chronic delays in psychotherapy for poor children. It has taken some limited steps recently toincrease mental health services for all MassHealth patients, adding a teletherapy program, and increasing spending on mental health services at community health centers by $50 million over the next five years. Suzor’s daughter Ashleigh Shevock brushed the teeth of a foster child. Suzor, the foster parent near Palmer, hopes the state moves quickly, because the procession of children arriving at her door shows no signs of abating. She started fostering after her older children left home. Some of the youngsters she’s taken in have stayed for months. Others came just for the night, like the frightened 1-year-old who smelled of urine, dropped off by a pair of social workers two years ago. After the social workers drove off, the toddler shrieked and clung to Suzor when she tried to bathe her. So Suzor did the only thing that felt right: She held the little girl in her arms, and rocked her for hours. A social worker returned to pick up the girl the next morning. Suzor has heard nothing about the child since. Suzor’s cozy but cramped house is a lively place, home to her 8-year-old daughter and four foster children. They share two bunk beds, a pair of cribs, and mounds of toys. Among the latest arrivals is a 2-year-old, back for the third time since 2017 because the toddler’s mother has repeatedly been deemed unstable. A social worker brought her back in mid-March, with everything she owned stuffed in a black trash bag. “How do I say no?” Suzor said. The next day, DCF called and asked if Suzor could take two more children. 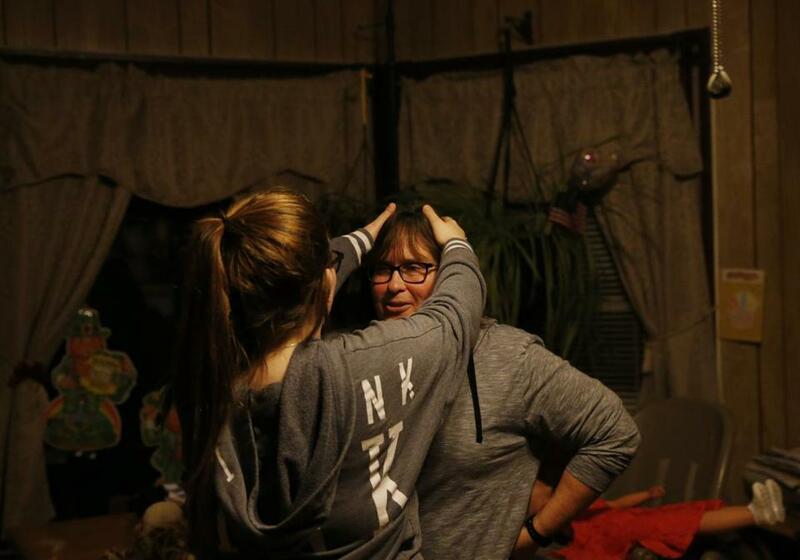 Suzor and her 14-year-old foster child shared a lighthearted moment.